Adam Clendening has always been known for his power play prowess. When the defenceman was coming out of the 2011 NHL Draft, scouts spoke highly of his finesse and skill with the puck, his deft passing and puck-moving abilities. When he hit the professional ranks, that expectation didn’t change. Taken in the second round, 36th overall, by the Chicago Blackhawks, Clendening entered the pros in 2012 out of Boston University. The blueliner was instantly given every opportunity to expand his offensive game, while re-tooling the defensive side. Adam Clendening celebrates a goal in the AHL. Photo by Steven Christy. The result? In 2012-13, he finished third amongst American Hockey League defencemen in scoring with 46 points for the Rockford IceHogs. 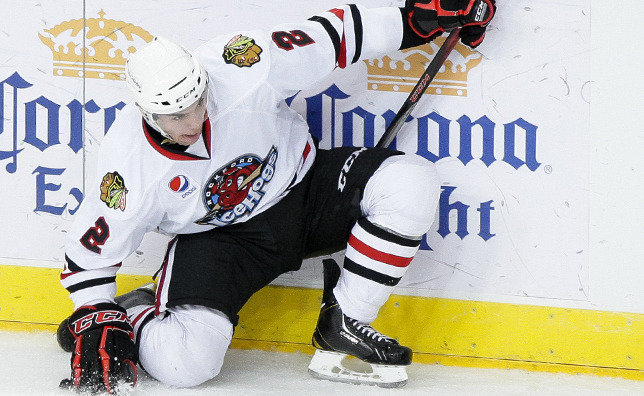 He was named a Second Team All-Star and Rockford’s Rookie of the Year. Things were looking up for the talented defender. In 2013-14, he set an IceHogs all-time franchise record for assists with 47. He was named an AHL First Team All-Star. Clendening showed great promise developing in the minors. 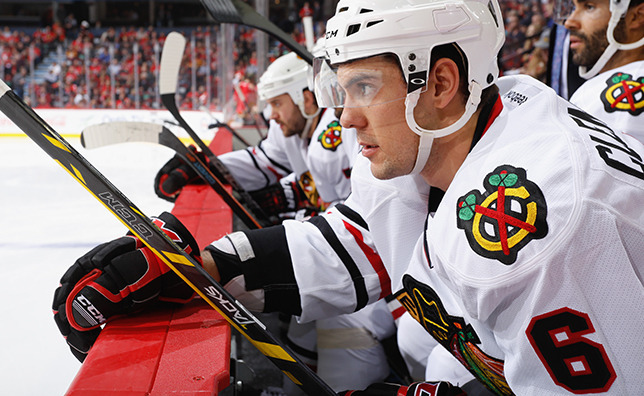 He earned his first NHL action last season, playing four games for Chicago, recording a goal and an assist. On January 29, 2015, he was traded to Vancouver, in exchange for Gustav Forsling. Almost a year to that day, Clendening was claimed off waivers by the Edmonton Oilers. But, leading up to Wednesday, Clendening has played for the Canucks and Penguins organizations since leaving the Blackhawks. 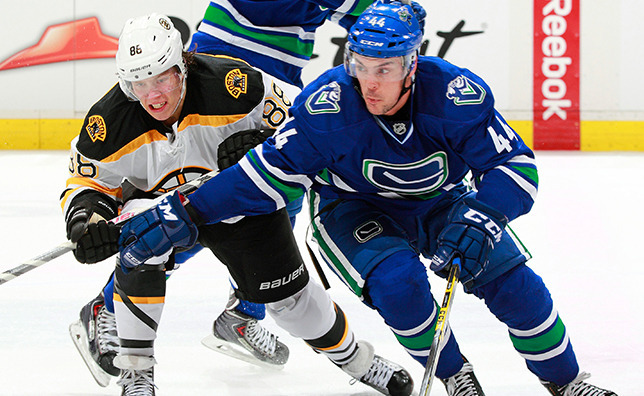 On July 28, 2015, Clendening was traded from the Canucks to Pittsburgh. Then on January 15 of this year, the blueliner was on the move again in a trade to Anaheim involving former Oiler David Perron. At each stop, Clendening says, he has seen an uphill battle to unseat entrenched veteran defencemen or rising prospects. Now, he gets another chance with Edmonton, a team with plenty of youth and some injuries on its blueline. On Clendening’s side is familiarity with the general manager. Oilers President of Hockey Operations and GM Peter Chiarelli would have seen a lot of Clendening at BU while working with the Bruins. Clendening says Chiarelli spoke with him while he was going to school at Boston University and has followed him throughout his career. The two spoke on Wednesday following the claim’s completion. "I spoke to Chiarelli this morning. He talked about the opportunity here and that they were looking for a right shot d-man." Clendening. By adding Clendening, the Oilers are bringing on board another right-shot defenceman, and one who has shown an ability to provide energy to a power play. “Running the power play, quarterbacking a power play, making a good first pass and puck movement and puck distribution are probably my biggest assets,” said Clendening. Last week, Oilers Head Coach Todd McLellan said a quarterback on the power play was something the club was looking for heading into the schedule following the all-star break. It’s something Clendening knows he can help with. “As far as opportunity on the power play, I’ve played on the power play on every NHL team I’ve been on,” he said. Three of Clendening’s five NHL points in 30 games have come on the man advantage. The 23-year-old blueliner is looking forward to showing the Oilers he can provide a boost in an area of expressed need, as well as proving he’s ready to stick with the organization for more than just the immediate future.